Delicious chocolate chunk cookies lavishly coated with milk chocolate! Impossible to resist the temptation of a Fox's cookie gourmet treat. Round butter cookies with chocolate chunks originate from the United States. Impossible to resist these generous and delicious cookies! 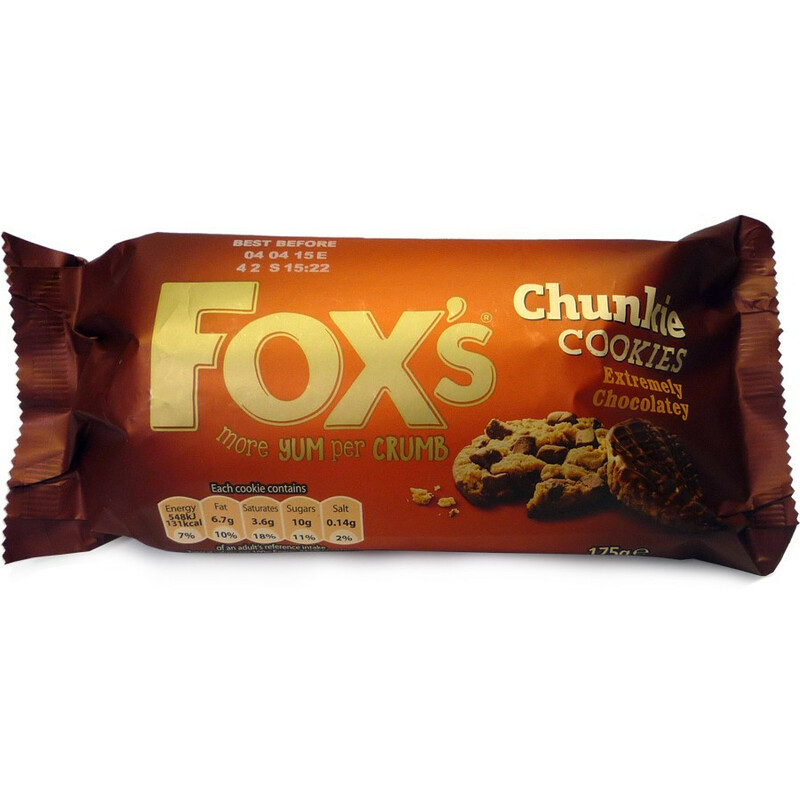 From very humble beginnings as a small biscuit factory at the north of England, more than 150 years ago, the Fox's company developed into one of the first leading cookie brands in the United Kingdom. The philosophy of Fox's Biscuits is to offer always the most innovative, imaginative and irresistible cookies. Ingredients: wheat flour (wheat flour, calcium carbonate, iron, thiamin, niacin), milk chocolate chunks (22%) (sugar, cocoa mass, dried whole milk, cocoa butter, dried whey [milk], vegetable fats [mango kernel oil, illipe oil, shea fat, kokum gurgi fat, palm oil, sal fat in varying proportions], emulsifier [soya lecithin], milk chocolate (16%) [sugar, cocoa butter, dried whole milk, cocoa mass, dried whey (milk), vegetable fats (mango kernel oil, illipe oil, shea fat, kokum gurgi fat, palm oil, sal fat in varying proportions), emulsifier (soya lecithin), palm oil, sugar, oatmeal, partially inverted refiners syrup, dessicated coconut, glucose syrup, molasses, raising agents (ammonium bicarbonate, sodium bicarbonate, disodium diphosphate), salt, emulsifier (soya lecithin), flavouring. Allergy advice: for allergens including cereals containing gluten, see ingredients in bold. May contain: nuts.